Takeaway: You often try to be as green as possible: you recycle your plastics, you bring reusable bags with you when you shop, and you do what you can to cut down on waste. But what about food waste? Food waste is often the last thing we think about, no matter how conscientious we are. Unfortunately, it is no harmless thing when it comes to the environment. Food waste most often ends up in landfills, where anaerobic decomposition leads to the emission of methane gas. Methane is one of the more potent gas emissions that leads to global climate change. In fact, it is more detrimental than carbon dioxide, even if the latter tends to get more attention. This is even before taking into consideration the ethical implications of food waste. Food production is a costly business, so the loss of food has implications beyond the wasted calories and nutrients that might have been used by others. In the western world, as much as a quarter of all food is thrown away. The United States, where as much as half of all produce is tossed, leads the world in food waste. Today, we often throw out food that our ancestors - even just one generation ago - could not afford to lose. Much of the food that ends up in landfills would have been used 50 or 60 years ago. So before you go to toss something, think about how it might be used in another meal. Get creative. And remember, you have the benefit of a freezer, which has not always been the case throughout history. Reserving the cooking liquid and food scraps from a meal can be the key to flavoring a second amazing dish. For instance, if you make mussels, the broth, onions and other vegetables can be reserved to flavor a risotto dish. Simply store the leftover broth in the freezer - preferably in a glass container with plenty of room at the top - until you are ready to make the next meal. Another great example is slow-cooked meats. A tomato-braised short rib, for instance, leaves plenty of thick, meat-infused sauce, which can easily be repurposed and used as a pasta sauce. Traditionally, our ancestors would have saved a lot of what we cast off in order to make nutritious broths. Save all animal bones in a large ziplock in the freezer. If you’d like, separate beef or pork bones from chicken bones. You can use these to make a delicious bone broth. Bone broths are extremely nutritious: they have high amounts of collagen, which support the body’s tissues, and tend to be rich in minerals. As an added bonus, having some fresh bone broth on hand will lend added flavor to meals that require it! You can also save the rinds of cheese to make a ‘parmesan broth,’ which is typical of traditional Italian cooking. You can store the rinds in the freezer until you have enough to make your broth, and then use the broth to lend a rich and delicious flavor to soups, risotto and other dishes. The great thing about both of these types of broths is that these materials typically cannot be used to make compost, which we will get into below. While the rinds and bones used to make the broth will ultimately be discarded, there will be as little tissue as possible available for degradation in landfills. Repurpose the pulp from your juicer. If you’re into health and wellness, and happen to own a juicer, then you’re aware that making juice creates a lot of produce waste. While the vegetable pulp can be composted, you can also get creative and repurpose it! Be creative and open to new recipes, like this one for juicer pulp crackers or this one for veggie juicer pulp ‘meatballs’. Composting is the go-to solution for food waste. If you cannot repurpose it, compost it. Composting is the process by which organic material is decomposed in order to provide nutrients and fuel to enrich soil. Note that in this case ‘organic’ means carbon-based, or a naturally occurring material, such as most food. The difference between food waste decomposing in compost and decomposing in a landfill, is that the greenhouse gas emission is much different. The natural decomposition process, outside of landfills, produces small amounts of carbon dioxide as part of the natural carbon cycle of the earth. This is much less detrimental than the methane emissions produced by food waste in landfills. Compost further benefits the environment by reducing the need for synthetic fertilizers. If you choose to compost, the process is quite simple. Even if you do not want to compost, you can collect food scraps in a container - you can even store it in your freezer to avoid any odor - and bring it to your local farmer’s market. Most will collect food scraps for compost free of charge. You can compost: eggshells, nutshells, teabags, coffee grounds, fruits, vegetables and other plant matter. You cannot compost: dairy products, grease, oils, bones, and meat scraps. Select a dry shady spot in your yard to keep your compost. 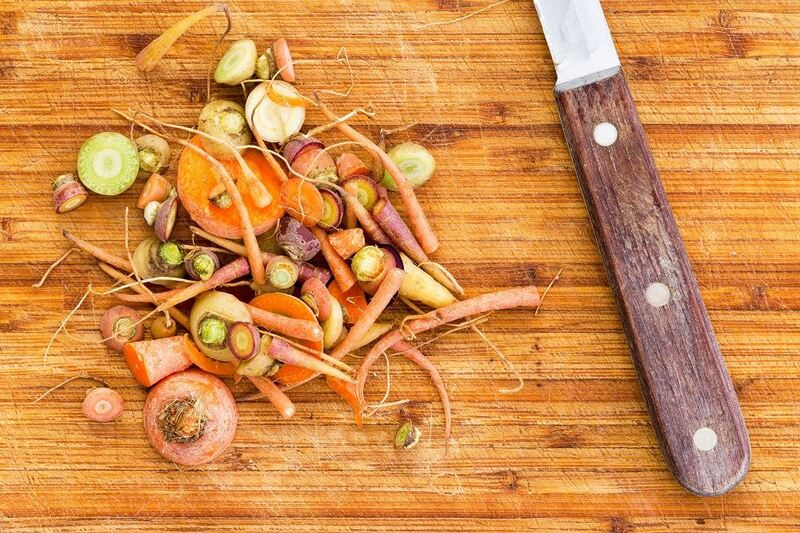 Mix food scraps with plant materials such as dead leaves or branches. Add water to your compost pile as needed to encourage decomposition. Turn over your compost pile regularly to mix the top additions into the base of the pile. Remember, whether or not you are composting at home or bringing your food scraps elsewhere to be composted, you will be benefitting the environment with minimal to no added effort on your part. And, if you keep a home garden, you will be soon reap the benefits as your soil quality improves and your plants thank you! Care for a Cup of Compost Tea? Your Plants Will!